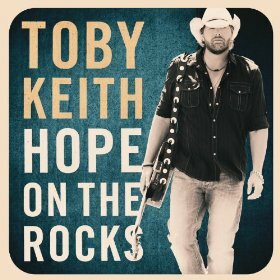 Toby Keith’s Hope on the Rocks was released today by Show Dog–Universal. The project is streaming at Spotify, and Amazon is selling the album’s standard edition for $5.00. Keith partnered with Clear Channel Radio for a text-to-win promotion airing on country stations nationwide. Winners of daily cash prizes will be entered to win a new Ford F-150, then flown to a secret location to pick up the keys from Keith. Lead single “I Like Girls That Drink Beer” is a hit heading into album launch week, with the title track set to be the follow up single. Keith’s promotional appearances include The Tonight Show with Jay Leno, the Late Late Show with Craig Ferguson and The Talk. He recently wrapped his 2012 Live In Overdrive Tour. Also, a “Red Solo Cup (Live)” video was released today.